BLOG: From the archives: Next stop, Suckerville! Author’s note: Back in 2005, 8NewsNow investigative reporter George Knapp and I teamed up for a story on the origins of the Las Vegas monorail for Las Vegas CityLife, an alternative weekly then owned by former Review-Journal parent company Stephens Media. The story remains the definitive account of the early years of the monorail, and provides valuable insights to the issue as its current managers seek county taxpayer funds to expand the line to the Mandalay Bay. I reprint that Sept. 15, 2005 story here in its entirety. The Las Vegas monorail train slows somewhat as it approaches its worst turn, a near 90-degree elbow at Koval Lane and Spring Mountain Road, as if to gain better purchase on the narrow track below. A female voice thanks riders for letting the monorail help their “trip down the Strip,” which is somewhat misleading. Although it comes tantalizingly close in places, the monorail never actually touches Las Vegas Boulevard. In a second, the train tackles the turn nicely, and the Wynn golf course turns into a green blur out the windows. The voice tells us the course was designed by Wynn and renowned architect Tom Fazio, one of many fun facts dispensed by onboard speakers. Soon, we’ll be at the Las Vegas Convention Center, one of the seven stops along the monorail line. Fun, indeed. And she, like most of Las Vegas, probably doesn’t even know half the story of the Las Vegas Monorail. It’s not just a transit project christened with a public-private ownership that seems to benefit whichever side of the house needs help that day. It’s not just the largest investment of state-issued bonds in Nevada history. It’s not just a punchline to falling-debris jokes. It is, without question, the biggest juice project ever seen in the Silver State. And its history is a fascinating, sometimes complicated, occasionally tragic journey into law, politics and, of course, a network of politically connected men who dreamed of a train in the desert. The monorail story starts and ends with the late Bob Broadbent, whose full name — Robert N. Broadbent — now is part of the monorail’s official moniker. A Boulder City pharmacist who helped incorporate that town, Broadbent was truly a good old boy: He’d served on the Boulder City Council, the Clark County Commission and in Washington, D.C., as “water czar” in President Ronald Reagan’s Bureau of Reclamation. While on the commission, Broadbent took on the Mob, and so angered members of La Costa Nostra that his life was threatened. But he wasn’t the type to scare easily, and he only carried an FBI-issued pistol for a couple days before resuming his normal life. Most people might consider Broadbent’s last government job — director of aviation for Clark County, starting in 1986 — a step down, but Broadbent loved it. He added the C-gates, and then the D-gates, with people-movers ferrying passengers to each. He even completed one of the first sections of what we now call the beltway near in the airport. And he did it all in record time. How? Broadbent was famously impatient with red tape and bureaucracy. And sometimes, that impatience brought him extra scrutiny. During his tenure at the airport, he oversaw 10 bond issues, all handled through friends and former co-workers who’d gone to work for investment firm Smith Barney. When former Clark County finance chief Guy Hobbs objected to the no-bid, sole-source contracts, Broadbent won, and Hobbs left the county to start his own, respected consultancy. In 1997, Broadbent was 71 and preparing to retire. But something better was about to come along. In 1995, MGM Grand boss Bob Maxey had built himself a monorail, using old cars purchased from Disney World, running casino customers to the Park Place-owned Bally’s, a little less than a mile away. He wanted the system expanded, but the costs were prohibitive. The gamers sought help from Clark County, and Clark County Commissioner Bruce Woodbury and County Manager Donald L. “Pat” Shalmy asked Broadbent to start up a specialized unit with the aviation department to oversee a “regional fixed guideway” in the “resort corridor.” Translated, they wanted a monorail on the Strip, one that would eventually connect McCarran International Airport with distant Cashman Field, with plenty of stops in between. They’d found the right person in Broadbent, who had a reputation for efficiency. And he dived right in, working with interested parties including the Las Vegas Hilton, which had been purchased by Park Place. One destination that was a must-stop for the new monorail would be the Las Vegas Convention Center, which was large enough to handle the big shows but crippled by bad traffic. According to the Las Vegas Sun, two companies were part of initial meetings with Broadbent and Hilton officials as early as December 1996: Broadbent’s old favorite Smith Barney, and Bombardier, the company that built the monorail trains for Disney. That was how Broadbent operated: as the hub of a tight-knit network, many of whose members shared Broadbent’s Mormon faith or even family connections. Cam Walker, for example, Broadbent’s son-in-law, would become his partner in the monorail venture. Fellow Mormons John Haycock and Henderson Mayor Jim Gibson would play key roles in the venture as well. In fact, most of the key players were Mormons. Some, like former Broadbent employee and current Regional Transportation Commission General Manager Jacob Snow call it coincidence. Las Vegas was first settled by Mormon missionaries, after all, and the church has had a strong presence here ever since. Walker has said Broadbent simply hired people he knew he could trust. What was the dispute? The Regional Transportation Commission increasingly viewed the project as the basis for a monorail that would travel through the heart of Las Vegas, the Strip and downtown. But hotels, including MGM Grand, Bally’s and Hilton were increasingly thinking of chucking the government approach and doing it themselves, which worried officials like former Las Vegas Mayor Jan Jones, who warned of two different systems that wouldn’t connect. Tellingly, Broadbent said in March 1997 that a private system could be built, and then later turned over to the public. In early April of 1997, the fissure grew into a canyon, as Jones Vargas attorney Greg Jensen told the transportation commission that hotels had decided to do things on their own. “We don’t want to be held up, slowed up or encumbered by the collaboration,” he said. If Jensen sounded somewhat arrogant, he was: There was real power behind him, and he could afford to throw his weight around. It wouldn’t be the last time monorail supporters got what they wanted. In fact, it would become the rule. For his part, Broadbent accelerated his retirement from the county. The public option was over. It was time to join the private sector. Maxey, who headed a steering committee of business leaders looking into monorails, had sounded the alarm that monorail backers needed to move fast, since the 1997 Legislature was in session. Broadbent, who’d joined up with his old pal and political warrior Sig Rogich to share office space, headed north to Carson City, to perform the first of many legislative miracles for his hotel clients. The bill passed, and the Las Vegas monorail was on its way. But it would be a bumpy ride. The next year, the county began the laborious process of granting a franchise, and Broadbent and his clients were furiously planning their monorail. One of the first hurdles to overcome was the most obvious: This was to be a for-profit, privately built, privately run train serving certain hotels, not exactly the picture of public service. Broadbent acknowledged candidly the dilemma — he said in September 1997 that “these hotels are building this system primarily to move their customers up and down the Strip” — but he also countered that there was a public purpose involved. Monorail riders wouldn’t take taxis, thus contributing to cleaner air and less clogged streets. It was to be the first of many intellectual costume changes that would allow monorail supporters to argue they were a private business one minute (so, therefore, you can’t learn how much people who work there are paid) but a public outreach the next (say, acquiring tax-exempt bonds through the state). What does it matter who the project benefited? It turns out that while claiming the project would be funded entirely with private dollars, the monorail backers were intending to ask the state to issue tax-exempt bonds for their project, a move that could save them millions in interest over the years. That lent credence to Friedman’s criticism that this was a private system, run for the benefit of casinos, who were essentially asking for public assistance. Even Broadbent would later admit publicly that the project would be jeopardized if the monorail couldn’t get tax-exempt bonds. Walker would later say that the company could have issued bonds itself, but using state bonds made the process cheaper and easier. In March, Broadbent declared that his consulting company, Transit Systems Management, would form a non-profit corporation in order to qualify for the state bonds, and that the debt would be repaid through farebox revenue. The non-profit corporation would be called the Las Vegas Monorail Co., and its board of directors would be ratified by Gov. Kenny Guinn, who was elected in November 1998. (The list of board members, however, was proffered by Broadbent and Walker.) The non-profit would own the monorail’s property, but have no employees, and contract the actual running of the system to Transit Systems Management. And, Broadbent told the county, he didn’t want to pay business license fees based on his revenue. Once again, he would get his way. In mid-1998, the county (with Broadbent’s generous help) fashioned a monorail ordinance that included the potential use of eminent domain. It was needed as leverage, Broadbent explained; otherwise, property owners might be reluctant to cede right-of-way to the monorail, and the project could be stopped dead in its tracks. The only property owners who really did complain lived in the Desert Inn Estates, a tony enclave at the corner of Sands Avenue and Paradise. Residents complained that unsightly support pillars and peering riders would reduce their home values significantly, and they argued bitterly against the idea at meetings. The battles, however, were only beginning. With its franchise in hand, and non-profit corporation formed, Broadbent headed to the state at the end of 1999 to ask for those bonds. It was, once more, a bumpy ride: The acting director of the state’s Department of Business and Industry, Charles Horsey III, declared “it’s a little risky” and later would call the venture “high risk.” Those were not words to settle anxious politicians or potential bond buyers. The monorail company had to endure reports that suggested farebox revenue would never cover operations, maintenance and debt service to repay bonds. “Broadbent may be good at strong-arming people in Nevada, but he knows nothing about public transit,” a frustrated Twitchell declared in May 2000, as the state closed on its decision. Relying on ridership numbers provided by URS Greiner Woodward Clyde — a company that had allegedly inflated projected ridership numbers in five cases in Florida, according to the St. Petersburg Times —monorail executives told the state they’d have 52,500 passengers per day. But in the end the state decided differently: In August 2000, in one fell swoop, the Board of Finance, headed by Guinn, issued $653 million in tax-exempt bonds, the largest amount in Nevada history. Because of the controversy, however, the monorail sought to reassure the public by getting insurance for the bonds, which were sold by Salomon Smith Barney, the same company that had been in on those meetings with Broadbent and hotels in 1996, and that had helped Broadbent finance so many improvements at McCarran in the late 1980s and early 1990s. With the money in hand, no hurdles remained save construction, a job that, not surprisingly, went to Bombardier. The Canadian maker of jets and trains was specifically chosen by Broadbent’s Transit Systems Management, a fact that would become tragically important later on. The only problem: When the company signed the franchise agreement with Clark County, it had promised to start building within two years, the anniversary of which was closing fast. Rather than rush the groundbreaking (which wouldn’t happen until August 2001, a full nine months behind schedule) the monorail broke ground on a “maintenance facility” at the Sahara hotel-casino. Technically, some construction work had begun, a distinction without much difference to a county that was not likely to pull the monorail franchise for missing deadlines. Walker and Broadbent planned to use more tax-exempt bonds to bring the monorail downtown, although the Regional Transportation Commission was studying using federal money to pay for mass transit downtown. A bill by U.S. Sen. Harry Reid allowed the government to consider the $653 million of bonds as local “matching funds,” the same as tax dollars spent on buses or roads. (Broadbent had once run for office against fellow Mormon Reid and lost, and the two were bitter enemies for a long time before they finally patched up their differences.) Reid was a key backer of the monorail in Washington, and helped to get federal funding for the project. 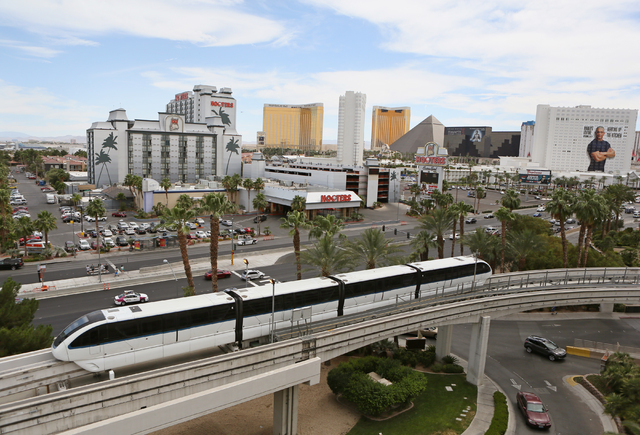 In June 2003, the Las Vegas City Council officially hired Transit Systems Development to bring the monorail downtown, an agreement that remains in force today, although no monorail was ever built. If a fixed guideway ever is built downtown, it will have to be built by Transit Systems Development, or a company that buys the franchise agreement from Transit Systems Development. Although things had gone fairly well for Broadbent up until this time, construction fell behind schedule in May 2002, due to slow building permits. Testing of the system, slated to open in January 2004, began in April 2003. But Broadbent had other matters on his mind. He and Walker traveled to Carson City personally with John Haycock, chairman of the non-profit Las Vegas Monorail Co., to defend themselves against a bill proffered by state Sen. Dina Titus that called for an audit of the monorail. Titus argued that since the monorail was being built using state tax-exempt bonds, and that Bombardier had fallen on hard financial times, it was prudent for the state to protect its bond rating with an audit. Broadbent and company said they’d be happy to provide financial statements, but resisted an audit. The bill, SB 362, eventually was approved, with Broadbent’s language. But before that could happen, and before the monorail could carry its first passenger, tragedy struck. Broadbent died at age 77 of complications from cancer at Boulder City Hospital. “Without Bob Broadbent, that monorail would not be a reality today,” said Woodbury in the Las Vegas Sun. “Bob Broadbent always saw farther into the future than any of us and always had a way, through sheer determination and dedication, of making impossible dreams come true.” Woodbury later moved to have the monorail renamed for Broadbent. Even without its founder, the monorail was inching forward, landing advertising contracts from Monster Energy beverages and cellular telephone giant Nextel, which would “wrap” trains in their logos. 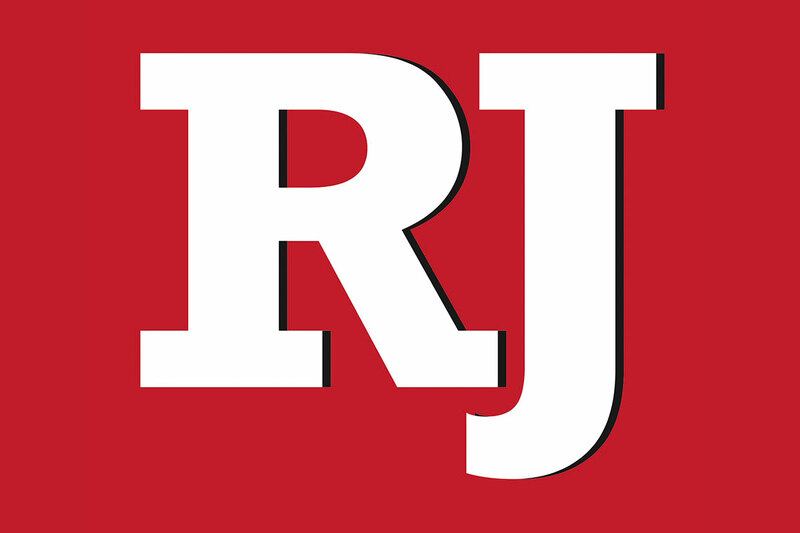 It prompted Patrick Pharris, chief executive officer of Promethean Partners, the monorail’s advertising company, to flights of fancy in the R-J: “When they’re walking down the Strip, or driving down the street, they’ll look up and see the train coming, people will say ‘Hey, there’s the Nextel train. I just rode that. That was so much fun.’ And they’ll say, ‘Now I want to ride the Coke train, or the Bacardi train.’” Probably not, but it seemed one executive had probably hit both of those trains in quick succession. March melted into summer, with Bombardier and Granite Construction, another contractor, racking up big fines for the delays. Finally, in a party that stretched to every station, the monorail opened on July 15, 2004, carrying 30,515 passengers on its first day. But the good times were not to roll for long. In August 2004, a worker running a train in “manual” mode opened doors on the wrong side of a train, facing nothing but a steep drop-off to the street below the Convention Center station. (The worker was later fired.) In September 2004, a rubber tire fell from a train, shuttering the system during the heavily attended MAGIC trade show. (In that incident, workers ignored an alarm warning of problems.) A few days later, a two-pound part fell from another train, shutting the system down for what was to be a long while. Fitch Ratings responded to the incident by putting the monorail’s bonds on a negative watch list, even as the monorail hired a disaster expert from California to locate the problems and fix them. By December, with only a single, allegedly defective bolt having fallen from a train during testing, the system was ready to reopen, which it did on Christmas Eve to a record crowd of 45,000 riders. But it was too late for the federal government, which withdrew its support for funding part of the downtown extension of the monorail. The train that was supposedly begun as a public service had cost the public millions in potential funding. And that wasn’t all: In February, a 30-foot section of electrified rail shorted out, stalling trains. By this time, Moody’s Investors Service had dropped the monorail’s bonds to “non-investment” grade, otherwise known as junk status, where they remain to this day. That black mark makes it harder for the company to borrow money, and certainly increases the cost to do so. In reality, however, it seems clear Gibson was forced out, along with Walker, as the Las Vegas Monorail Co. took over Broadbent’s old Transit Systems Management. Curtis Myles, a former airport employee under Broadbent who also worked under Jacob Snow at the Regional Transportation Commission, was hired in July to be chief executive of the non-profit monorail company. In an interview, Myles said Gibson may have left eventually, but the string of mechanical failures likely hastened his departure. Although Broadbent had established the non-profit corporation to acquire those state bonds, he also sought exemption from the sales and use tax, which means everything purchased by the monorail company would be tax-free, including trains, construction materials and supplies. “We went through the normal process to have this non-profit exemption, as do all others in the state of Nevada,” Walker said in a 2004 interview. The monorail did go through the process, but questions have been raised as to how normal it was: The tax exemptions were granted in private; the decision was never publicly announced and the monorail itself didn’t disclose the fact, which might have been of interest to investors. Before 2003, the Nevada Tax Commission decided on exemptions. But that year, the Taxation Department persuaded the commission that applications for exemptions could better be handled by staff. Although the monorail had applied for the exemption in 2001, no action was taken until 2003, two weeks after the commission stopped hearing exemption cases. The Taxation Department’s exemption committee decided in private that the monorail met the state’s legal requirement to be considered a charitable organization, a decision worth millions to the monorail — but one that would cost taxpayers. Despite statements to the contrary from tax officials and monorail executives, the decision was never posted on the state website. And just days after making the monorail decision, taxation officials received a request from Bombardier to rebate $743,000 in sales taxes it paid for the first train delivered to the monorail system. In 2004, monorail executives and state tax officials denied knowing anything about the rebate request, although memos obtained by CityLife from the state show the request was made in writing in March 2003 and was faxed to the state from the offices of the Las Vegas Monorail. After the exemptions became public in July 2004, monorail executives repeatedly proclaimed they deserved the status of a tax-free charity by citing state law: They were providing a service that is required to be provided by government, i.e. mass transit, a key point disputed at the time by Friedman and others, who argued the monorail was a benefit only to the hotels that had built stations to receive willing gamblers. But the monorail’s contention may be wrong: State law says a private group providing a service that government is required to provide may be considered tax exempt; but there’s no law that requires government to provide Strip monorails. The tax code also stipulates that any tax-exempt charity must donate or otherwise dedicate a substantial portion of its services to the legitimate subjects of charity, like the poor, the elderly or the handicapped, or to schools or churches. What’s more, state law says no one associated with a tax-exempt charity is supposed to make a profit. But the monorail’s corporate structure is unique: All taxable assets are owned by the non-profit Las Vegas Monorail Co., but all salaries are paid through Transit Systems Management, which as a private company is not required to disclose how much everyone was earning. Last year, Transit Systems Management was paid more than $7 million. It has fewer than 21 employees. The public also was not told about the very quiet decision to grant the monorail similar tax breaks at the county level. Todd Walker, Cam Walker’s brother who served as monorail spokesman, the land given to the monorail by the casinos for stations is worth $100 million or more. When county officials quietly decided to grant the monorail an exemption from all property taxes, that previously-taxed casino land was pulled from the tax rolls. Clark County Assessor Mark Schofield estimates that takes more than $3 million dollars a year out of the county’s coffers. Instead, the system pays a mere $50,000 per year in franchise fees, which could be generated in less than one day of average ridership by people paying the full $3 fare. “I personally find it a travesty that the Las Vegas Monorail system is going to escape millions of dollars in taxes and the only benefit they’re bringing to this community is, what? Ride the train to seven major resorts?” Kelesis fumed. And there’s the future of the train itself to consider. Myles, for his part, says he wants to take the monorail to the airport, a plan he’s thought about so much, he can draw potential routes from memory. A second option would be the west side of the Strip, where former monorail opponent Mandalay Resort Group and Mirage Resorts (which once declined permission to have the monorail pass by the Treasure Island on its way to the Fashion Show mall) are now both owned by MGM. What about the eternal question: Will the monorail ever fall to taxpayers to fix? Still, Broadbent repeatedly predicted the public would one day own the monorail line. For his part, Cam Walker has said it would only happen “if the public asks for it.” Then again, the public never asked for a train to begin with; hotels did. And the public — at least the Las Vegas public — gets negligible benefits from it; hotels reap most of the rewards. Myles says 94 percent of all monorail riders are tourists. Technically, if the monorail defaults, bondholders own it. If they elect not to run it, the assets of the non-profit company could be given to a government agency, like the state Department of Business and Industry, which issued the monorail bonds, or the county. (The 1997 law that created private monorail franchise agreements contains a provision that stipulates if the system is taken by eminent domain, the county must run it for a certain period of time before shutting it down.) And there is always the option of getting rid of it entirely: Under the franchise agreement, $6 million has been set aside for demolition of the system’s pillars and stations. Myles hints that there will be a new push for riders, and perhaps some changes to fares, which at $3 per one-way ride are higher than any other public transit, but far cheaper and faster than a taxi plying the same route. Riding the monorail can be disorienting at first, even if you know the landmarks. You can see the First Interstate tower in the Howard Hughes Center, and the Hilton, and the Wynn, but you’re not immediately sure which way you’re going unless you have a map. And, with trains whisking along tracks so as to arrive at stations every five minutes, there’s not a lot of time to get your bearings. That must have been a little like riding with Broadbent and his machine in the old days. It was a sometimes bumpy ride on a fast-moving train that occasionally stopped to get its bearings, but always barreled on, and always made it to the end of the line. At just about 15 minutes from end to end, the monorail they built is a quick ride that seems like it should last longer. Whether he was right or wrong about the monorail — and it looks like he was wrong, since the traffic that grips the Strip is still pretty bad — he was most definitely wrong about the other thing. He wasn’t just one person. He was the person, at the right place and time, to pull off Nevada’s biggest and most awe-inspiring act of political machination in history. Some of us call it the juice train.